Giant codfish weighing up to 400 pounds once flourished in the Gulf of Maine. The cod fishery appeared limitless and its value to Europe helped settle and enrich New England and Eastern Canada. Now the much smaller cod that survive are embattled by years of overfishing and other pressures. One of the major pressures is climate change. Cod are also comparatively scarce, say scientists, and likely to become scarcer as ocean temperatures rise. Changes to the fishery caused by changes to the climate were the subject of a recent two-day symposium sponsored by the Island Institute of Rockland, Maine. More than four dozen fishermen, scientists, fishery managers and representatives of non-governmental organizations (NGOs) met in Portland, Maine from July 31 – August 1 at the “A Climate of Change” event. For the past few years, fishermen have been reporting higher water temperatures and lower catches of traditional groundfish, said officials at the nonprofit Island Institute. 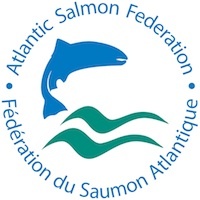 They organized the symposium to give all stakeholders an understanding of how climate change is already affecting fisheries in the Gulf of Maine and how the changes will affect future fishery management. 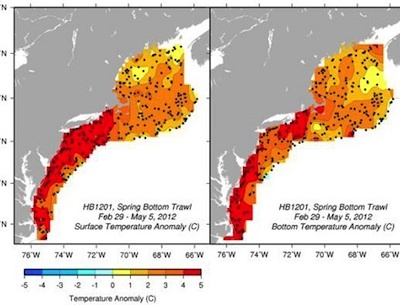 The 2012 Spring Survey by the Northeast Fisheries Science Center showed waters warming on the East Coast by more than 6°C. Fishermen also have reported shifting fish populations, including an increase in invasive species such as green crab, and an influx of more southerly species such as red hake turning up in their gear. A bit to the south, Rhode Island fishermen say they are catching southern species such as Atlantic gar, cobia tilefish, mahi mahi, clearnose and barndoor skates. None of these species are plentiful enough for targeted fisheries and scientists warn that “pioneer” species should not be targeted until their numbers are sufficient and scientists have had a chance to research them. Bob Steneck, University of Maine marine sciences professor and one of the state’s premier lobster scientists, told attendees that traditional stocks in the Gulf of Maine, never numbering much more than 100 species, also have become less diverse. The huge cod more than three feet long, common hundreds and thousands of years ago as evidenced by bones found at coastal Indian sites, are “ecologically extinct,” he said. Lobster and lobster harvesters have benefited from the absence of the large, finned predators, but even the boon of high lobster catches might not last forever, said experts. Lobster harvests reached record highs in the past two years at 105 million pounds and more than 123 million pounds respectively. However, the high landings have not translated into profits—the industry has suffered from a combination of low prices for lobster and high costs for fuel and bait. Canada’s lobster fishing areas are open at different times of the year specifically so lobster fishermen can harvest hard-shelled lobster, but the lobster moulting patterns are being affected by warmer water temperatures. The fishing industry has taken a pro-active approach to science by helping fund a project called Canadian Fisheries Network, offering grants to university science departments. The universities fund the research by masters’ students on on local fisheries science issues. The network is halfway through a 5-year series of projects that includes research on the effects of climate change on lobsters. Cod have moved farther north, Steneck said, due to warming ocean temperatures. The record high sea surface temperatures also give lobster more places to settle larvae. “Places like New England saw new species typically found in warmer waters, closer to the tropics,” University of British Columbia Assistant Professor William Cheung, said recently in a news release. Cheung is co-author of a study on ocean warming featured in the May issue of the journal Nature. “Climate, while important, was not the primary reason for the collapse of cod,” Tom Dempsey reminded the group. Dempsey, policy director for the Chatham, Massachusetts-based Cape Cod Commercial Fishermen’s Alliance, added: “We did that. We mismanaged our ecosystem. We made that mess.” Dempsey also serves on the New England Fishery Management Council (NEFMC). Lee Crockett, U.S. Oceans director for The Pew Charitable Trusts, co-organizers of the event, told the symposium an ecosystem approach to New England fisheries management could help embattled groundfish recover from years of overfishing and cope with additional changes anticipated as a result of climate change. “We need to think about a system holistically, rather than focusing on individual species as if they do not have interactions with others,” Michael Fogarty of NFSC said. Fisheries managers in New England have discussed employing an ecosystem approach for many years, and the Pacific Fishery Management Council has designed an ecosystem-based plan they will implement soon. Crockett also urged more protections for marine habitat and further reductions in overfishing. Fishermen said they are trying to be flexible and forward-thinking while trying to adapt to unpredictable changes. Lobstermen anticipate diversifying their fisheries so they are not relying only on the now-abundant crustaceans. Porter told the group he tries to maintain other permits by fishing for scallops and mahogany clams as well as lobster. While fishermen anticipate a future fishery for the increasing red hake, scientists say they want to look at what they call “pioneer species” before allowing a commercial fishery. “When fish are new to an area we need to understand the impacts of fishing on the fringe of a species’ range,” said Pew’s Crockett. “A crisis is a horrible thing to waste. It looks like a normal day out there, but it’s not–it’s not normal,” said John Bullard, northeast regional administrator of NOAA Fisheries, calling the conditions caused by climate change an opportunity as well as a crisis. Urging creation of more flexible models for resource management, Linda Mercer, director of the Maine Bureau of Marine Sciences, suggested new scientific data should be used to underlie those models when they are created. NEFMC has plans to reopen a couple of areas closed to groundfishing since the 1990s—one in the Gulf of Maine and another in Georges Bank. Closed to protect spawning stocks, increases in haddock and cod populations and evidence the fish are older in closed areas, prove the closures work, say critics of the plan to reopen them. James Churchill, research specialist at the Woods Hole Oceanographic Institution (WHOI) in Massachusetts, said migration, mating and spawning patterns should be considered, then suggested closed areas could be moved to fit those patterns to protect the fish.